Popular Tourist Attractions in Lombok Obligation Worth Visiting - Tourist Spot in Lombok - Lombok Island is a small island shaped horizontal inverted Q, located in the province of West Nusa Tenggara government to the city as a provincial capital Mataram. The island is known as "Thousand Island Mosque" is in the point coordinates 116.351Â 8.565Â ° S ° E, with a small area of ​​the island around 4,725 km² in the Lesser Sunda islands are separated by the Lombok Strait from Bali Island which is located in its western Sebelat, and the Alas Strait in the eastern island of Sumbawa. Senggigi Beach is one of the most famous tourist area in Lombok. Waves at the beach is not so big, its long coastlines be more beautiful with sand gradation from black to white. Amazing! In the area of ​​Senggigi Beach Senggigi, West Lombok mancaneraga visited by many tourists. Most of them spend time with swimming and sunbathing. Which makes this beach so special long coastlines. As long as the eye could see, tourists will be presented with the beauty of Senggigi Beach clean lines. Tourist attractions in Lombok next popular is the 3 Gili Gili Trawangan, Gili Air and Gili Meno. Gili Trawangan is the largest of the three small islands or dyke located in the northwest of Lombok. Trawangan is also the only dyke which height above sea level is significant. Trawangan has shades of "party" more than Gili Meno and Gili Air, because many parties all night every night of the show rotated by some public places. Gili Trawangan (as well as in two other dyke), there are no motorized vehicles, because it is not allowed by the local rules. Common means of transport are bicycles (rented by locals to tourists) and cidomo, simple horse-drawn carriage which are common in Lombok. For traveling to and from the third dyke, people usually use motorized boats and speedboats. Tourist attractions in Lombok is the third most popular Mount Rinjani. This mountain has a fairly large crater, in which there is a crater lake called Segara Anak lake. The lake is believed to have magical powers, according to stories circulating in the community, widely seen apabilaDanau Segara Anak, indicating that the age of the person who saw it was still long. Vice versa, if it looks narrow, it indicates people who see short-lived. And for that, you should do a self clean and quiet spirit before looking back Segara Anak Lake. Popular tourist attraction in Lombok is Kuta Beach Lombok selankutanya. This beach has white sand is located in a village called Desa Kuta. Kuta village started to become an attractive tourist destination in Indonesia since the establishment of many new hotels. In addition to the natural beauty that can be enjoyed in this village, once a year Sasak ceremony held in this village. It is a ceremony of Bau Nyale. In this ceremony the sailors looking for worms nyale at sea. Island is indeed rich with tourism potential. Among the tens or even hundreds of places and favorite tourist destination, there is a corner in the South West Lombok Island which is quite amazing that is Mas Beach. The beauty of the beach with sparkling white sand, sea of blue, and some nan stunning natural scenery can be enjoyed at these attractions. Mas coast lay in the West Lombok, West Nusa Tenggara. Sightseeing is fairly easy to reach by the visitors from any corner. From Mataram (the capital of the province), for example, you just take the time 1 hour with a mileage of about 60 km past the Sheet Harbour. 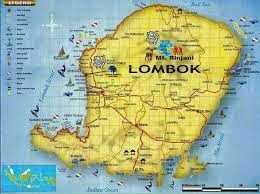 Or by rotating via South East South Central Lombok to the West a distance of approximately 75-85 km of Tourism in Central Lombok Selong Belanak there. 0 Response to "Popular Tourist Attractions in Lombok Obligation Worth Visiting"
Cara Ganti Nama Akun COC "Clash Of Clans"
How to Make Brown Lipstick Work for You ? "Marketing Your Practice With A Blog"
"How to Make Your Pets Happy And Healthy"
"How To Day Trade For Income ?" 6 Ways to Avoid Driving Off With a Junker ! 10 Cara Meningkatkan Hubungan Anda Seketika !